A version of the cool helmet-mounted displays worn by military pilots will soon be available for business jets and civilian helicopters. Last week at the Paris Air Show, Thales unveiled the TopMax and TopEagle Helmet Mounted Displays, and their technology is just as relevant in the civilian world as it is to military aviation. Unless their aircraft is equipped with a heads-up display, civilian pilots must look down and away from windows in order to consult instruments for airspeed, altitude or any other crucial information. Because airplanes are, in general, pretty fast, even a small glance away from the aircraft’s external conditions increases the chances of pilot disorientation and collision with terrain or another aircraft. Helmet-mounted displays were originally developed to improve guidance for heat seeking missiles in air-to-air combat around 40 years ago. In the last decade, the Department of Defense has introduced the visor-based Joint Helmet Mounted Cueing System (JHMCS) for the Navy, Marines and Air Force, which projects basic flight, targeting and cueing information in monochrome. Many other countries have their own versions of the technology, some dating back to the early 1990’s, such as the Israeli DASH system. In addition to providing firing solutions, helmet-mounted displays provide heightened situational awareness while decreasing pilot workload by displaying vital information immediately in front of the pilot’s field of vision. Advanced versions are able to display images and video as well as many other layered visual cues. Helmet mounted displays improve upon heads-up displays because pilots see persistent information instead of just when looking directly in front of the aircraft, and even then only within a relatively narrow field of view. 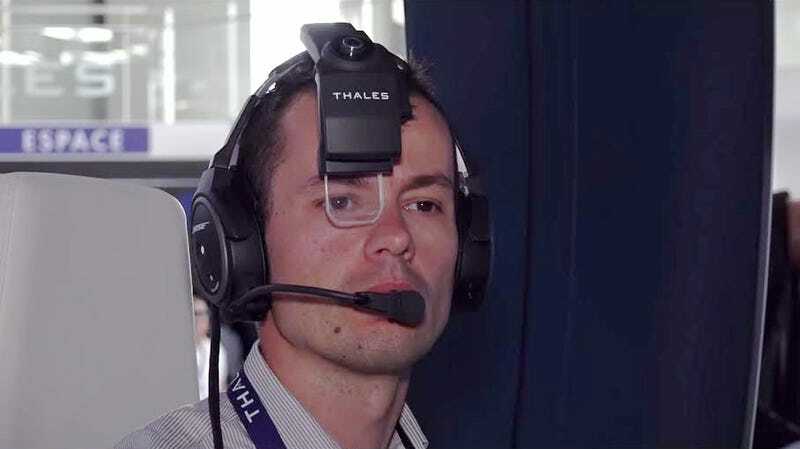 The TopMax unit displayed by Thales at this week’s Paris Air Show is a single monocle eyepiece mounted to a Bose A20 Aviation headset by clipping onto the headband, without interfering with the ear cups, pivot points or boom microphone. While the demonstration unit uses a Bose headset, The TopMax system appears as though it could integrate comfortably with a pilot’s preferred headset brand. The overall footprint is very compact and looks like it will easily conform to cockpit environments in which physical space is at a premium. Thales’ new TopEagle helmet mounted display for civilian helicopter pilots is “helmet agnostic,” or capable of mounting to any helmet design, as is the company’s Scorpion system for military pilots on which TopEagle is based. The TopEagle system weighs just over 4.5 pounds and can be passively integrated into cockpits, meaning it could be retroactively installed in older aircraft. Helicopters are constantly operating in congested altitudes with many different obstacles, so the TopEagle system will prove especially beneficial in the vertical lift regime. Military helicopter pilots have used helmet mounted sights for decades, beginning with the AH-64 Apache attack helicopter and now in the multi-role UH-60 Blackhawk, among others. Both TopEagle and TopMax have a camera which tracks reflective stickers placed on the top of the cockpit ceiling. This, combined with an inertial measurement system, calculates the movement of the pilot’s head to produce a useful visual display. Both systems are fully compatible with night vision goggles as well as heads-up displays. Once these new Thales systems achieve certification (expected in 2016 or 2017), civilian pilots will be able to see navigational data, terrain avoidance warnings, airport guidance and other relevant symbology directly in front of them, in full color, using the same compact display for daytime or nighttime flights. Civilian helmet-mounted displays will likely work just like those in a fighter jet, displaying datalink and sensor-derived contacts (such as other aircraft) with tags and visual identifiers. They could even display TCAS (traffic collision avoidance system) data and radar information piped in from air traffic control. These capabilities drastically increase efficiency in the cockpit, which could potentially save valuable time when lives are at stake. For search and rescue, first responder, and law enforcement pilots, this could be the difference between mission success or failure. Nearly 1,000 of Thales’ Scorpion helmet mounted display units are in use in the United States Air Force. The company recently announced that the system has undergone 400 hours of testing on the United States Air Force’s stealthy air dominance fighter, the F-22A Raptor, although they declined to discuss any pending procurement decisions. The next generation of helmet mounted display technology is currently in development for the Lockheed Martin F-35 Joint Strike Fighter. The controversial jet’s Distributed Aperture System (DAS) provides pilots the ability to “see through” the aircraft by stitching together a combined synthetic image from external cameras embedded in the aircraft’s skin. The technology has fascinating implications for ships and land vehicles, and a version will very likely appear in future civilian aviation. Helmet mounted display technology has trickled down from the military to civilian applications, and is now evident in wearable technology beyond the realm of aviation. Google Glass, despite never being released for consumer purchase, successfully demonstrated the utility of augmented reality in a variety of new contexts, such as manufacturing and medicine. Another example is Oakley’s Airwave snow goggle, which projects performance and social data directly in front of a skier’s eye. A startup company called Skully has developed a motorcycle helmet with an integrated heads-up display, offering riders a multitude of useful features such as a rearview camera and GPS navigation data. Wearable technology and the Internet of Things will only continue to pervade the human experience and everyday life, largely as a result of technological innovations pioneered in aerospace. It has taken 40 years for helmet-mounted display technology to mature from a military-specific niche application to viable commercial cases, but it won’t be more than a few more years until such displays are commonplace. Helmet-mounted displays are no longer in the exclusive domain of Topgun pilots and will be a key technology in revolutionizing the commercial, business jet, and general aviation cockpits of the near-term future. Considering the technology was originally developed to knock aircraft out of the sky, the fact that systems such as the Thales TopMax and TopEagle will soon be enabling aircraft to operate more safely and efficiently represents a truly positive evolution of military technology into the civilian world. Plus, it will just be downright cool for non-military pilots to finally get to use such awesome gear.